You love your wife, right? Or your husband? Or your boyfriend? Or your mistress? Clearly, you love someone. I hope. And when that special, beloved individual has a birthday, that person deserves better than a cheap cake from Costco (unless that person is my soon-to-be 5-year-old, who is getting a cheap cake from Costco). When my wife had her birthday a couple weeks ago, I called up one of the top pastry chefs in the country. Because she works just down the road. Michelle Gayer was nominated for a national James Beard Award—the only nominee who runs her own bakery instead of working in a fancy restaurant. The Salty Tart is inside the wonderful Midtown Global Market. This is a vanilla bean cake with white chocolate frosting. 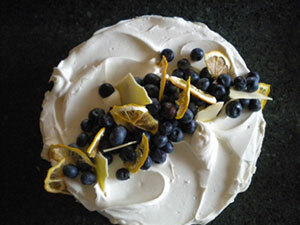 The topping: fresh blueberries and dried lemons. Stunningly beautiful. 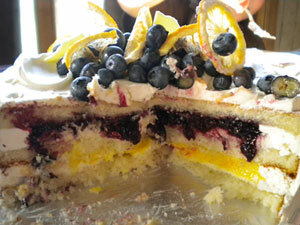 Inside: lemon and blueberry fillings. And yes, it was as delicious as it looks. I just called the main phone number and Michelle asked me if I wanted chocolate or fruit, and I told her to come up with something cool. She did. I called with about a week’s notice, but I don’t think you even need that much. It served about 8 to 10. Cost: $38. And worth every penny. So step it up, people. Go buy a special cake. 920 East Lake St., Mpls.